There were presents. Wonderful handmade and thoughtful gifts. Woodworking, embroidery, sewing, cooking, crocheting were all represented. There was food. Lots and lots of delicious things to eat. Our dinner culminated in an eggnog cheesecake with a raspberry sauce and whipped cream. Oh, so delectable. There was a lot of fun. 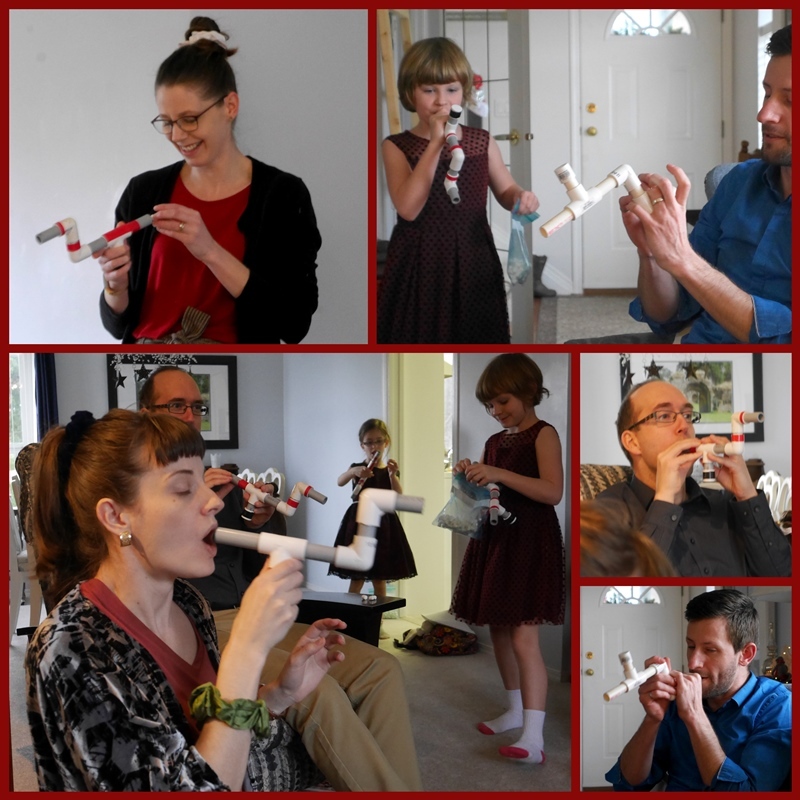 The marshmallow shooters were a hit with young and not-so-young folks. Tim and I were last home from church on Christmas Eve because we stayed to talk to out-of-town friends for a bit. When we opened the door to the house, we were bombarded with mini marshmallows shooting at us from every angle. So much fun! We're still finding those little white balls in the oddest spots. There was a trip on the ferry to the mainland to see my parents and siblings. Rain fell, coming and going. It didn't stop the merriment. Everything appeared rather ghostly through the rain. We were glad to arrive home last night. I determined to do very little today, and I met my goal. When the rain eased to a mizzle I went out for a walk. Lovely fresh air cleared my head. Bright moss coated this rocky spot with cheerful colour. More grey over the rooftops and into the distance. A few hours later, a strip of pale pink showed above the horizon. Most of the day has been spent here, in front of the fire, with copious cups of tea and a few cookies, along with a new book. This evening will be the same, with perhaps a switch to a movie instead of a book. Are you finding time for walks and peaceful moments in this week between the years? Linking with Friday Bliss, hosted by Ritta of Floral Passions. We've finally gotten some great snow and there have been walks, making paths and taking pictures of the hoar frost. Not too cold so it's nice to walk and enjoy without freezing. Were you affected by the wind? We've been worried about our beloved vacation spot on Salt Spring and will be sending a note or two to see how everyone fared. Christmas sounds like it was a great success at your home. We had a lovely time, the best ever, we all keep saying! Very relaxed with no big plans but to have friends over and be with our kids. Just the right way to end this very busy but amazing year. You had a lot of fun :)) Your Christmas gifts were so beautifully wrapped that it must have been a pity to open them! The raspberry cheese cake looks soooo divine. We have one combination word to describe the days between the years - Välipäivät. I usually spend them as you, resting and reading. But many people rush to shopping malls because the year-end Sales have begun. Instead I bought online Icebugs to keep me standing on the slippery roads. Wishing a happy Sunday and a Great and Healthy New Year! It does sound so celebratory and fun. But the quiet, and a cup of tea at the end, while letting the fresh memories settle in the consciousness.... You've just reminded me that I need a cup of tea right now! Blessings on your new year, Lorrie! I can't wait to read that book! I'm on a waiting list at my library. Your celebration looks like such fun. I love that you gave handmade gifts...that will always be special! Hugs! I'm reading the same book right now. Your family looks like they're enjoying themselves. It sounds like you had a wonderful holiday. We have had so much rain here, it has been hard to get outside. Flooded areas are making driving difficult too. We have had over 78 inches of rain this year and broke a record. Hopefully the rain will slow down in 2019! Have a wonderful New Year. Your family Christmas pics (here and on FB) made me smile. We also got rain here which is kind off odd for winter. The temperature has dropped so woke up this morning with a light dusting of snow on the ground. Haven't done much but battle this pesky cold over the last few days. I'm hoping so much my comment will actually publish - I've had so many problems with Blogger over the hols Lorrie and feel awful that I haven't been able to keep in touch with you and many others! Perhaps today Blogger has fixed the problem - here goes!!! Love the photos of the family 'shooting' you and Tim with marshmallows - if only criminals would change to them! Your weather must have made the ferry a bit bumpy - I love how you stalwart Canadians in B.C. manage to enjoy your beautiful land/seascapes even in the rain. We've just broken the record here for rainfall - yes, I can vouch for it, more rain than I ever recall in NC. Bob and I send best wishes to you for this coming year - stay healthy, be happy and know your friends from far away think of you often and were so glad to have the chance to meet you this year. We have had a peaceful Christmas, made all the nicer having a daughter and grandson here, at last! Your dessert looks amazing, I didn't rise to anything so clever. Now it is time to look at the garden catalogues and vaguely plan the flower beds. Lovely post. What fun those marshmallow shooters were! Love that you were bombarded! I'm happy to say we've had some lay low days since the fun filled days with our kids. So necessary to recuperate. Lorrie, I just had to laugh at the marshmallow shooters! And I am drooling over the eggnog cheesecake with raspberry sauce and whipped cream! Your holidays sound lovely. Thank you for sharing them with us! Lorrie, it looks like you had a wonderful Christmas Eve and Christmas Day. It's wonderful to have family and friends around. I love the marshmallow shooters, how much fun are they! Wishing you and your family the best in the New Year. I loved picturing and Tim being bombarded with marshmallows as you came through the door!! Such fun, Lorrie! I must say that your gift wrap is one that I'm going to store away...so simple, and beautiful. Oh, how I'd love to join you for tea and a chat by your cozy fire. Happy New Year to you and yours! It looks like a fun Christmas together. Marshmallow shooters is a new one for me! What a lovely Christmas season. I loved the marshmallow shooters. How fun to play. The pie looked delicious, but what appealed to me most was just sitting by the fire with a good book, a cup of tea, and cookies. Now that is the perfect way to celebrate. It certainly looks a fabulous Christmas-time.